Summary: Queue management is an essential factor to determining customer satisfaction in a service operation. Normally, bad queue management results “just” in customer inconvenience or annoyance. This article reviews the queue management for the immigration service at Dulles International Airport that is so bad that physical injuries could have resulted. 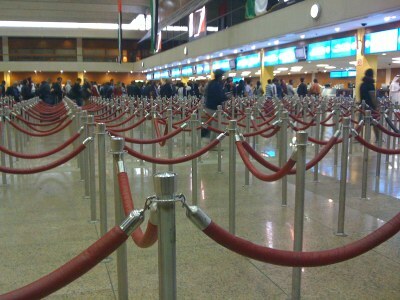 In all service operations, queue management is critical. It affects the customers’ experience as well as the efficient use of resources. Queues can be either virtual, as in a call center, or physical as in supermarket. One would think that it’s easier to manage physical queues since they’re visible. With basic observation, the problems in a queue can readily be seen. Imagine my disgust at being a participant in two poorly managed queues in one trip, traveling back from Dubai through Washington, DC. In each, some fundamental principles of queue management were violated to the point of criminal negligence at Dulles International Airport. Yes, criminal negligence. I’m not a lawyer, but that’s what I would call it. The first “bad” queue was the immigration check point leaving (and entering) Dubai. Just like the supermarket, each immigration agent has his own queue. In other words, there was not one line feeding all the agents. The nearby photo shows the extent of the rope queues. When customers judge service, equitable treatment is a key element. With separate queues for each agent, wait times can be very uneven. Agents work at different speeds — boy, do they ever! — and immigration checks of some people take far longer than others. If you are stuck in a slow moving line in this model, you’re stuck. You can watch people in other lines move far faster, as I did. I unknowingly wound up in a queue for processing families, who take longer to process. No indication was made in signage or in verbiage that this was a special queue. But once you’re in it and you realize your mistake, what can you do? Emotionally it’s tough to leave a line in which you’ve “invested” considerable time and go to the end of a longer line. “Line jockeying” is usually a fruitless action. Worse, some queues fed multiple agents! Those lines moved very quickly, but you couldn’t see the queue dynamics until you were committed to a queue. Then the people managing the queue commit the ultimate sin. When they open a new line, they take the new arrivals, not those who have dutifully been waiting. Go to a Trader Joe’s, and you’ll find when they open a new checkout register, they try to maintain the First Come, First Served (FCFS) prioritization. I thank the cashiers for doing that; it blows their minds. Dubai passport control could have had one queue with the “snake” that most of us know so well, but they choose not to. Not only does the single snaking queue ensure FCFS equity, but there’s a positive psychological element. Snaked single lines are in constant motion – assuming there are lots of agents working. That movement reduces the perception of waiting time, even if the waiting time would be the same as the one-line-per-agent setup. Perception is everything in customer service. However, the average wait time is less in a snaking queue than in the multiple line queuing system The excessive wait time for those caught in the wrong line leads to far longer average wait times for the system as a whole. These shortcomings in Dubai paled in comparison to the shortcomings I encountered at Dulles International Airport upon return to the US. The immigration area has the preferred single line feeding multiple agents. (Actually, they had 2 separate service areas, one for US passport holders and a second for non-US arrivals.) The failure in Dulles is that the geniuses who designed the system do not seem to understand the arrival pattern of “customers.” While there is some randomness to the arrival pattern here, which is very common in service operations, here there was a predictability. My 777 from Dubai arrived around 6:15 am, plenty of time for my 8:30 connection — or so I thought. We followed directions from an immigrations person to proceed down the corridor and take the escalator downstairs. The area at the base of the escalators filled very quickly. We weren’t moving forward at all and people kept coming down the escalator. Where were the immigration or airport personnel to manage the dynamics of the queue? I don’t know, but doesn’t the airport — or someone — have a responsibility to monitor the process and to prevent personal injury that could result from passengers following instructions? I cannot marshal strong enough words for the incompetence of those in charge of this operation, both designers and controllers. How could no one be responsible to monitor the state of the queue system around the base of the escalators? Notice I said that the line was barely moving. I mean barely moving. It was 20 to 30 minutes at least before we finally got into the main hall for immigration. There we entered a snaking queue — but slowly. It took 10 minutes for us to turn the first corner in the snake. Now get this. I counted 11 — that’s eleven! — rows in the queue. Do the math. At that rate, it would take almost 2 hours to get through immigration, and I’m not including the time to just to get into the hall. Yes, I’m enough of a geek to calculate these things. But I saw a great final exam question for one of my operations management classes. I counted roughly 25 people per row, which means the immigration hall was designed to hold just under 300 people. (Here I am discussing only the queue for US passport holders.) That also means that they were processing about 25 people in 10 minutes. We couldn’t see how many immigration agents were working from where we stood, but it was readily apparent that more staff came online at 7 am. Suddenly, we started to turn a corner every 4 minutes. Either staff was doubled or someone told the agents to pick up the pace (which I doubt). I made my flight with a little time to spare, but I suspect others missed their connections. I mentioned negligence. Here’s why. One of the responsibilities of a queuing system designer is to make sure there’s enough room to hold everyone — or everything — in queue. Imagine a supermarket that didn’t have enough room in front the checkout registers for patrons with their carriages or a gas station with cars queued up into the street. I would estimate there were 400 to 500 people in the queue around 6:30 in the morning, 300 in the hall and at least 100 in queue outside the hall. The physical system could not hold that many people, which is why there was almost the pile ups at the end of those escalators. Since the physical design had shortcomings, those with operational control responsibilities should have monitored the queue and blocked off the escalators. But if you think of the nature of this queuing, the incompetence is even more glaring. In most service systems, how many people arrive is unknown. With good data collection, the pattern can be estimated, but there will be some randomness to the queue length. Queuing models can help predict queue length. Here, the number of passengers arriving at immigration is known! Without being too snide, can’t the immigration folks check the incoming flight schedule to see the number of flights and passenger counts? Apparently not. One basic principle of queue management to attack a queue before the queue lengthens. It takes a long time to work down a long queue. Unfortunately, here the additional staff appears to have gone on duty at 7 am even though three large international flights (I believe) arrive at Dulles between 6 and 7 am. Let me get really cynical. Next to the immigration agents were little used kiosks for those people who have registered with immigration in the Global Entry program. Is the horrendous service a device to push people to registering? The cost doesn’t bother me, especially compared to the “cost” of the long queues, but I value my privacy too much to want my fingerprints on file. I do know the easiest way to fix this problem. Have our congressional representatives abandon their chauffeured private military transportation on overseas junkets and make them use Dulles immigration. The problem would be gone in a matter of days. How many of you service managers reading this commit some of these queuing mistakes? Are your queues equitable? Are wait times too long? Do you have enough of a holding pen for people queuing up? Do you staff in anticipation of demand or in response to a demand spike? Do you capture and analyze the data to allow you to make fact-based decisions? The design issues for a physical queue are the same as for a virtual queue, say in a contact center. Because we can’t see the queue doesn’t mean we don’t have to manage it. Bolton Local Historic District Survey — A Critique What Survey Mode is Best?